The Office of Fair Trading (OFT) has told Lloyds Banking Group to strengthen the balance sheet of its newly-launched TSB business. The advice came in recommendations made to the Treasury on the planned sales of bank branches by Lloyds and Royal Bank of Scotland (RBS). The OFT approved both sales, but said providing TSB with additional capital would help increase its market share. Lloyds said it would provide TSB with an extra £40m. The BBC's business editor Robert Peston says the OFT's approval is significant because it clears the decks the return of a chunk of Lloyds to the private sector, as well as the sales of the bank branches, required by European competition rules. Lloyds is still 39% owned by the government following the bank bailouts at the height of the financial crisis. The government has an 81% stake in RBS. Lloyds said the extra money given to TSB would help enable future customer acquisitions and develop its branch network, which currently numbers more than 600 branches. 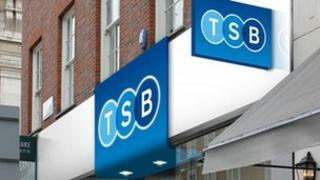 The bank also said it would enhance TSB's profitability by over £200m over four years. TSB is expected to be floated on the stock market next year, marking the end of Lloyds' branch sale, named Project Verde. Meanwhile RBS is currently in the process of selling 315 branches, named Project Rainbow, to one of three bidders.